Most pallet rack beam capacities are based upon "evenly distributed loads". This refers to the front-to-back direction as well as horizontally along the beam width. But what does that really mean? Looking at it from a side view, as shown below, the load rests across the top surface of the beam, and the full height of the beam absorbs the load weight. When loads are not evenly distributed, beam capacities are less than as shown in our published capacity listings. For instance, when loads are concentrated between beams, as shown below, the load is applied only to that portion of the beam that is below the step ledge. In the case of a 3-inch (high) beam, the load would be applied to less than one half of the steel in the beam. Obviously, capacities will fall in this scenario. 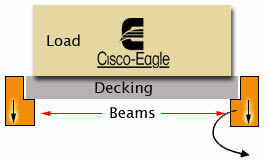 Loading as shown in above results in the load being applied to the beam in an "off center" fashion. With the load applied only to the "step Ledge", a "twisting" force is applied to the beam. This force can cause the beams to spread, as well as possibly causing the beam to tear out of the keyholes in the columns. For any projects involving non-standard loading patterns, please contact us for design assistance. This isn't to say that you cannot load directly onto rack decking, especially if that decking is sufficient to handle the load, but you should use caution on very heavy loads. Ask us for help if you aren't sure.